Currently my class is doing story writing. I've been using the strategy of using story substitution as a way to teach the elements of good story planning. For the third and final story activity, I wanted them to take the activity to a final copy. I also wanted them to compose their first draft digitally. Typically I have done this using Google Document. Then I got thinking. We are making a substitution story from a book. Why not actually have the student's final copy resemble the original: a book. I did not want to make this an epic process, however. I know there are very creative ways to digital storytelling with younger students. However, my students already have the skills to use Google Presentation. 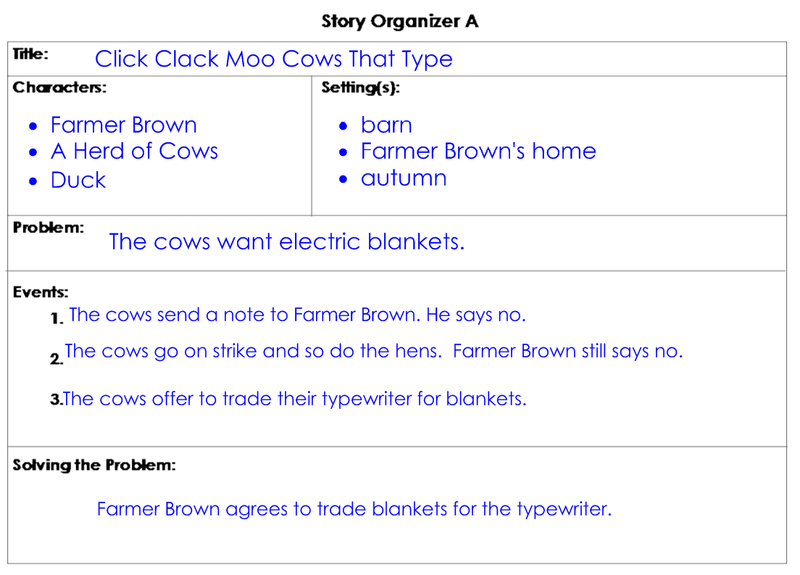 I decided to try a new book for story substitution this year: Click, Clack, Moo, Cows That Type by Doreen Cronin. At the end of the book we discussed the elements of the story. I modeled the planning stage on the Smartboard. I created a story organizer based on the discussion we had as a class at the end of the teacher read aloud. I suggested that it would be fun to start where the author left off - with the ducks having the typewriter and wanting a diving board. So I modeled how that would look on the organizer. Then students were given their own organizers and told to pick a different farm animal to use as their substitution. I put the class substitution plan on the Smartboard and reviewed it. Then I explained we would be making a book for this story and that Google Presentation when printed would be like a book. Again I modeled the process. As my students have used Google Presentation a number of times, I did not spend much time on the technology side. I flipped between the plan and our writing and went back to the original book itself with the students as we wrote our substitution story. "new slide" button that adds a slide with a title and body. I will have students delete the title text boxes later. Step Four: What About My ELL Student? I have a student who is very new to English and my classroom. I wanted him to participate in this activity. For the planning stage I asked him to choose a farm animal. He selected goat and I showed him that he needed to change cow to goat on his organizer. Then I asked him what that goat wanted: meat. Again I showed him how to make the substitutions. I am fairly certain he was not ready for story writing. So I typed up the story into Google Presentation (thankfully I am a fast typer and it is a short story). I shared it with him. His job is to go through the story and make the substitutions like he did on his plan. This gives him experience with Google Presentation and allows him to participate in the class activity. I have not decided if I am going to have them add images to make it truly a picture book. I may use this as a story, once students are finished their composing, as an anchor activity. This is something they can work on if they finish other projects early. Alternatively, I may have them illustrate their book once it is printed with pencil crayons. My students have not done peer editing on Google Apps yet this year. I think this would be a great project to introduce this important piece of the writing process. I think I will have them practice on our class story first before commenting on a partner's work. I have a number of students who are skilled writers. Not only do they finish a writing activity quickly, but they do it well. I plan to give them mini-lessons on enhancing the text artistry of their story. For example changing the font for the typed notes to Times New Roman and making some of the words bold to add emphasis. Reflection on: Read, Write, Doc!